Just ten days to go until Sat Sept 7 and what promises to be a great day. Come along and spread the word far and wide. Further details have been revealed of the éirígí programme of events that will take place on Saturday, September 7 to mark the 100thanniversary of the 1913 Lockout and the foundation of the Irish Citizen Army. The day of commemoration and celebration will include four separate elements, beginning with a walking tour of the key sites of the Great Lockout including the James Larkin statue, Liberty Hall, Pearse Street Garda barracks and City Hall. Such was the demand for places on the tour that it, unfortunately, became fully booked out by mid-August. The walking tour will be followed by a wreath-laying ceremony at the James Connolly statue beside Liberty Hall at 4.30pm. This event will see a reading of an extract of Connolly’s writings before a wreath will be laid by a ‘Volunteer’ in full Irish Citizen Army uniform. Music and a minutes silence will then bring proceedings to a close. 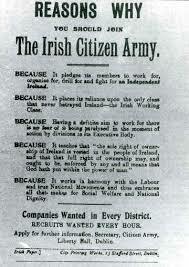 At 5.30pm the main event of the day will take place with a public talk in O’Connell Street’s Gresham Hotel. The two main speakers will be author, historian and University of Limerick lecturer Dr Ruán O Donnell and Cathaoirleach éirígí Brian Leeson. In what promises to be a very fitting and interesting talk the two speakers will focus on both the key events of Ireland’s greatest industrial dispute and its’ legacy in the Ireland of the twentieth and twenty-first century. The Gresham Hotel event will also include a musically accompanied slide show of images from the 1913 period. And all members of the audience will receive a small gift pack as a reminder of the event. This gift pack will include copies of a number of relevant historical documents as well as the commemorative stickers that éirígí has produced to mark the Lockout. At present Mick’s interviews and various pieces of video footage of left-republican funerals, commemorations and so on are quite scattered. They’re on youtube, many (but not all) are on this blog. Mick’s daughter Rachel has set up a new blog, so they can all be together in one spot, although many of them will continue to be added here as he produces them. 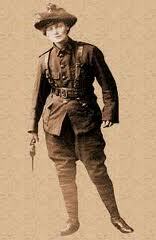 The new blog is the Irish Republican and Marxist History Project. Take a look at it, visit it regularly and please do whatever you can to support it. 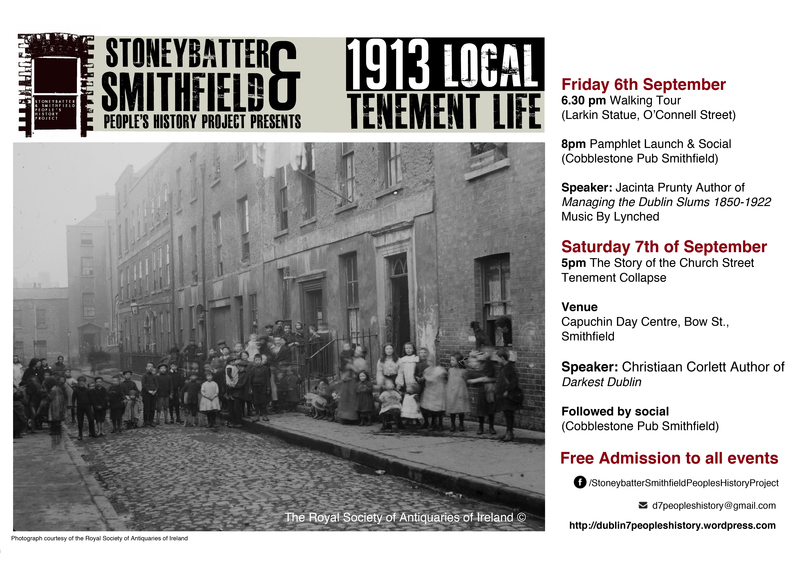 What looks to be a very interesting public meeting on the above subject is taking place at 7.30pm, on Thursday evening, September 12 in the Cobblestone Pub, 77 Kings Street North, Smithfield, Dublin 7. This event will commemorate the Irish left-republicans groups of the 1960s-70s. There have been many, usually distinguished by their small size and anti-imperialist views on the Irish national question and a commitment to workers’ power. Through the politics of the national question, these groups occasionally reached beyond their small numbers, cultivating the tradition inspired by James Connolly who argued that the national question is also a social question. Following the contributions of each of the speakers, there will be a Q&A session. A number of Saor Eire veterans will be in attendance and will take part in the discussion. These include Frank Keane (who was also a former IRA Dublin Brigade O/C), Des Keane and Liam Sutcliffe. 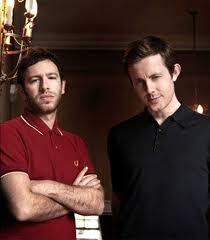 Charlie O’Neill and Simon O’Donnell have also been invited. I’m having a little break from political reading at present, as I draw up a new reading list for the rest of this year. The only thing I’m reading at present is the memoir of H.E. Bates, one of my favourite novelists and short story writers. It was originally published in three volumes, but I’m reading the omnibus edition. I’ve finished The Vanishing World (which covers his life from birth in 1905 until his first novel was published in 1925, when he was only 20) and am part-way through The Blossoming World. He ended up a bit of an old reactionary critic of the unions and welfare state but, oddly enough, kept a real humanistic feeling for people and their problems in his novels and short stories. 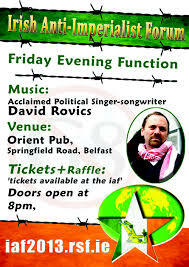 US radical singer-songwriter David Rovics performs a number of songs about Ireland, as well as Palestine and other causes. Some readers of this blog may be familiar with him. He’s just been prevented from entering New Zealand – stopped at Narita Airport (Tokyo) and asked to speak to New Zealand Immigration on the phone. 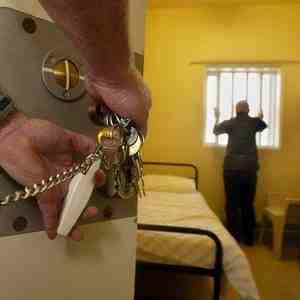 The immigration official told him she’d been looking at his blog! While the NZ Musicians Union are trying to get him into the country, gigs in Christchurch (tonight) and Dunedin (tomorrow night) have had to be cancelled. 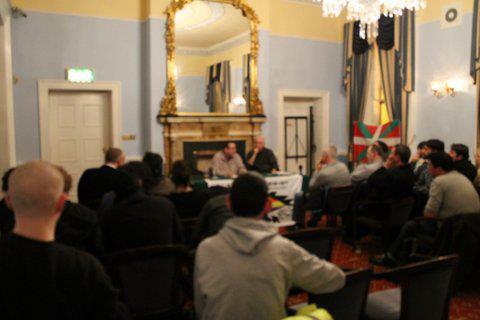 About 50 people attended a meeting back in March in the Teachers Club, Parnell Sq, Dublin last March to hearing about the crimes of Francosim and the impunity of the fascist criminals to this day in the Spanish state. The event was part of International Solidarity with the Basque Country week. The audience was addressed by Ahaztuak representative Martxelo (left of photo) and Diarmuid Breatnach (right of photo) translated. You can watch a video of the meeting here. 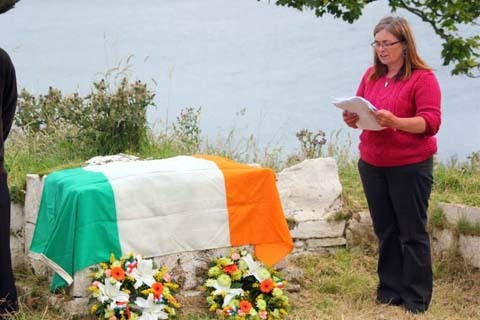 On Saturday 3rd August, 2013, republicans and socialists alike gathered at Murlough Bay on the north Antrim coast to pay tribute to the life and sacrifice of Roger Casement – humanitarian, patriot and Glensman. Chairing proceedings, local éirígí activist Conchúr Mac Cárthaigh welcomed the assembled crowd to the first annual Roger Casement Commemoration, jointly hosted by the socialist-republican party, éirígí, and the Irish Republican Martyrs Commemoration Committee (IRMCC).